“I got one, I got one” came the cry from the far side of the large cement slab. We dropped our poles and ran over to see a nice sized bass carefully being hoisted out of the water. 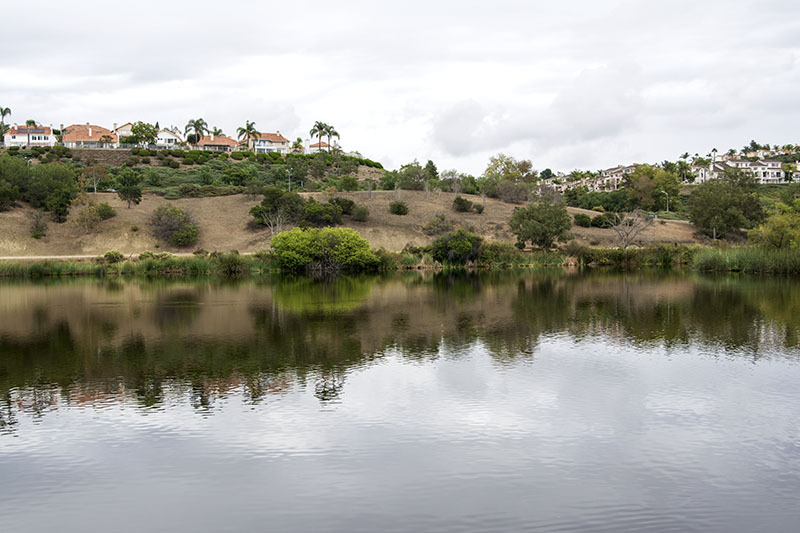 This marked the end of three hours of barely a nibble and the beginning of the next three hours packed with plenty of fishing action on Laguna Niguel Lake. 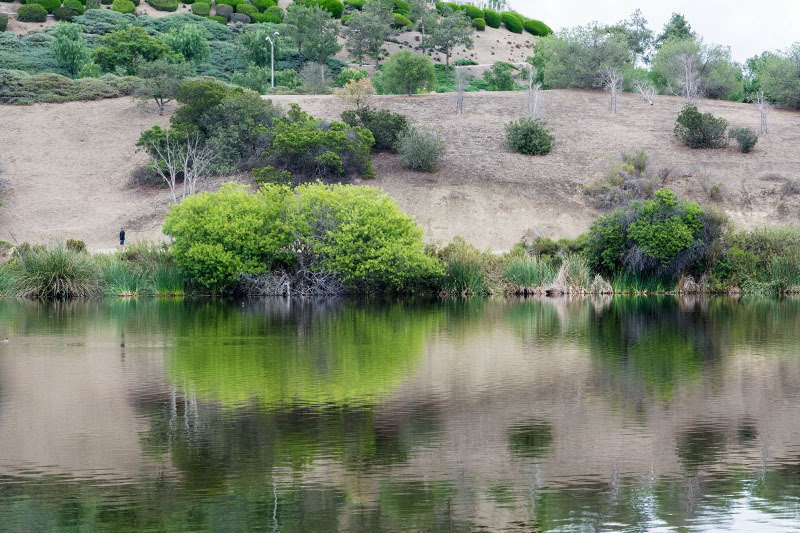 The 44 acre Laguna Niguel Lake is one of hundreds of lakes scattered about in California. 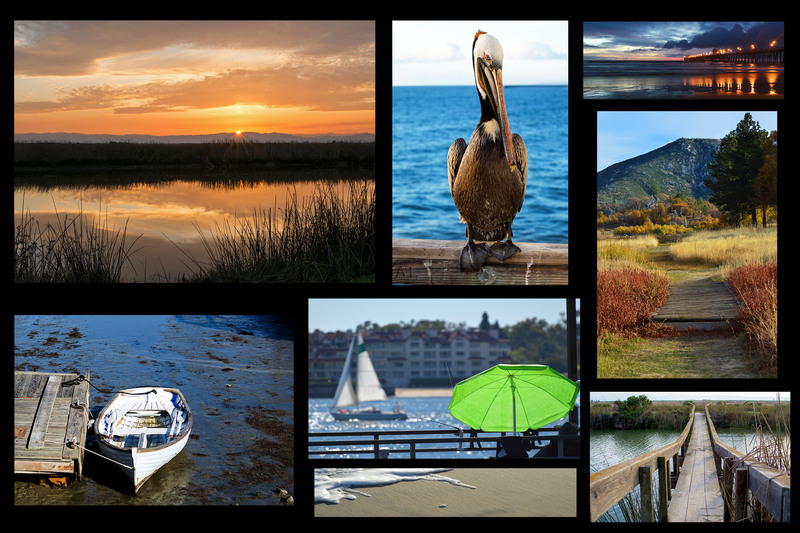 The largest lake situated entirely in California is the 68 square miles of Clear Lake in the northern part of the state, just above Sacramento. Although Lake Tahoe is by far the largest lake, it only shares part of its shores with California, the rest with Nevada. 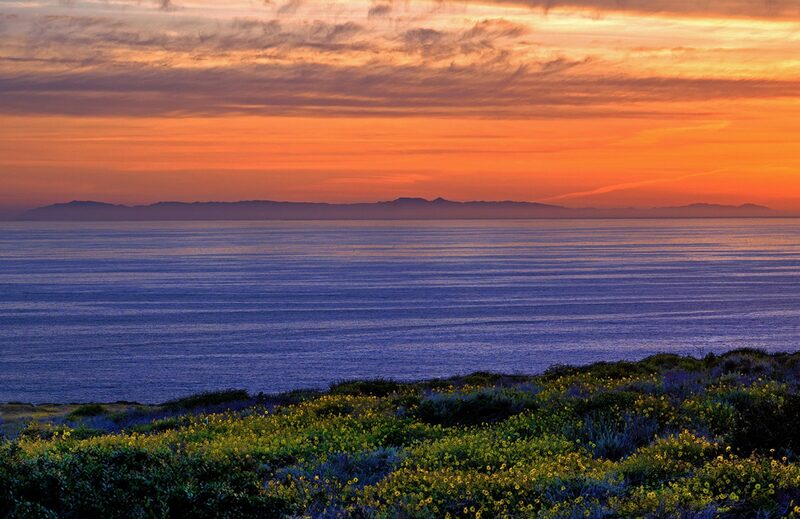 With California’s diverse topography you will find beautiful lakes up and down the state from scenic mountain lakes to tiny desert reservoirs and everything in between. Some are unknown gems that are tucked away in the middle of a city similar to the subject of this story. 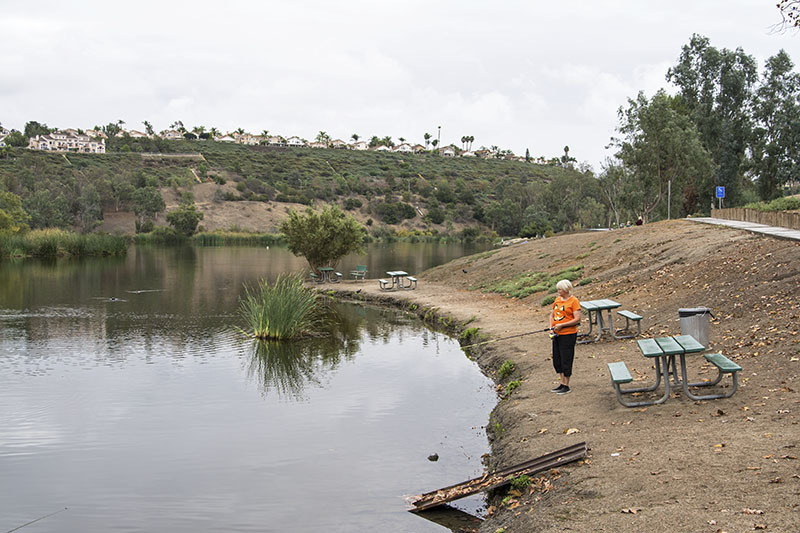 Up until a few years ago you could rent small boats on Laguna Niguel Lake for fishing or just for fun. Unfortunately, that operation has since been shut down and no boats are allowed on the lake. After that closure, all you will find is a deserted dock and an empty shell where the shop once was. However, you can still fish from the shore from one of the many little beaches scattered about on the lake. 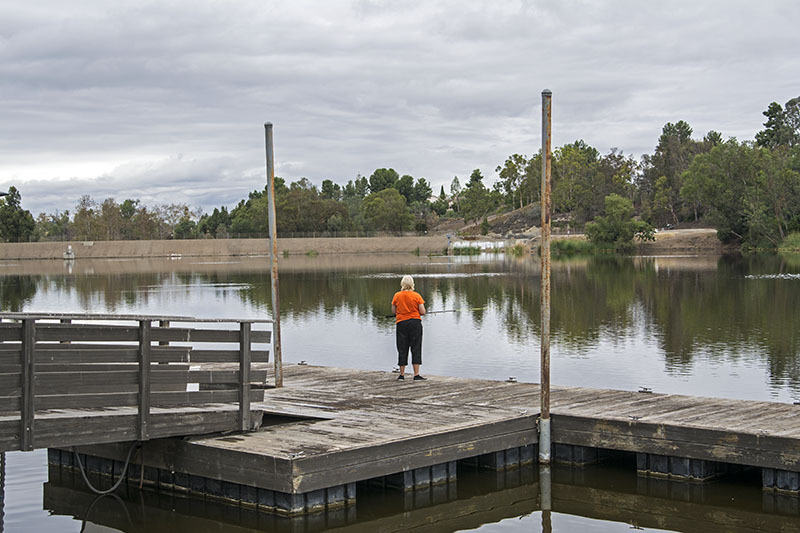 Plus the regional park surrounds the area with plenty to do, if you don’t feel like fishing. On a gray day in October, three of us girls decided that we would try our luck fishing from the shore. It was a large area with a connected dock that I am sure at one time was lined with boats ready to shove off and explore the lake. Today, it is an oversized, mossy, cement patio that we were hoping would be a great place to fish. Especially since no one else was there, did the locals know something we didn’t? We read that the lake was stocked with bass, catfish, trout, and carp although we didn’t believe it as it was quiet as can be for three hours with barely a nibble. For awhile we were content just enjoying this beautiful setting with the trees, birds, and the calm of the lake. We know fishing takes patience; still you want some action, so after awhile we threw our lines out on one of the beaches nearby. There was nothing happening there either so we headed back up to the cement slab for munchies, a drink, and to try again. The guy who was fishing to the north of us was gone now so one of us headed over there to try her luck. It wasn’t too long before we heard the above mentioned yell of a fish on the line! Pulling the fish out of the water gave hope to all of us and delight to the former bored fisher-woman. So began the shift to that side of the structure to start another three hours of fishing with a much different outcome, this time it was non-stop nibbles with eight fish caught! The reeds at the shoreline evidently attracted the fish and we all cast in that general area. Two of our crew are beginners and they of course caught the most and the largest fish. The last fish of the day was brought in from the newest beginner who snagged a huge bass. She had caught a few smaller ones earlier and was casually reeling this one in when all of a sudden she realized she had to do some work!! The pole was bent almost in half and you could see her struggling with the reel. When that thing was final brought up, all of us were in awe of its size. A photo was snapped but it just didn’t do the size justice. I hate when in real life the fish looked way larger than the photo, but it was!! With that thrilling ending, we decided to leave as the sun was slowly dipping below the horizon. From a snore fest of a beginning to an action packed ending, we had a great time fishing this lake. The ranger told us it was open until 9:00pm but starting in November it would be closed at 6:00pm. 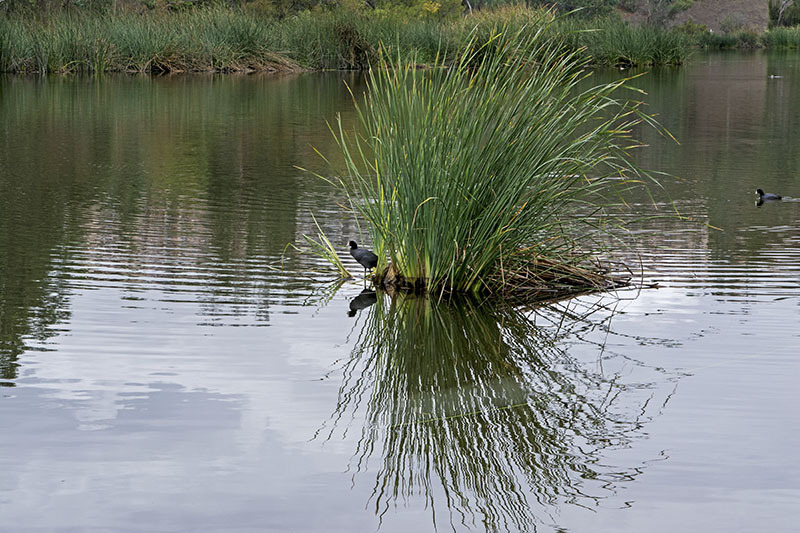 Besides some wonderful fishing, the lake and the surrounding park is a great place to picnic, hang out, bird watch, walk your dog, bike, hike, etc. 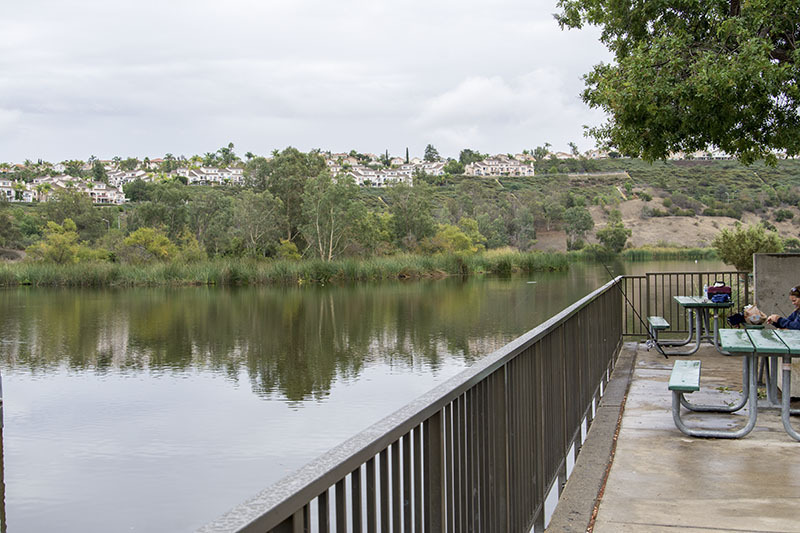 Ignore the homes on the hills and concentrate on the surrounding area which is full of hills and trees plus the lake has a small island in the middle that is a protected bird sanctuary. We saw cranes, ducks, geese, and an unidentified bird with feathers that were a beautiful navy blue. I kicked myself for not bringing my telephoto because when the white geese took off in flight it was a beautiful thing. I could only admire from afar. 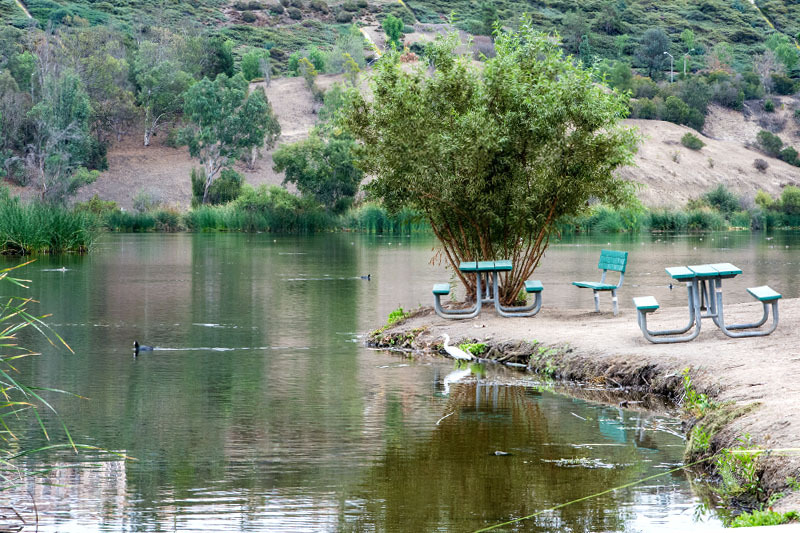 Beyond the lake sits the Laguna Niguel Regional Park which is dedicated to a wide variety of activities as mentioned above. 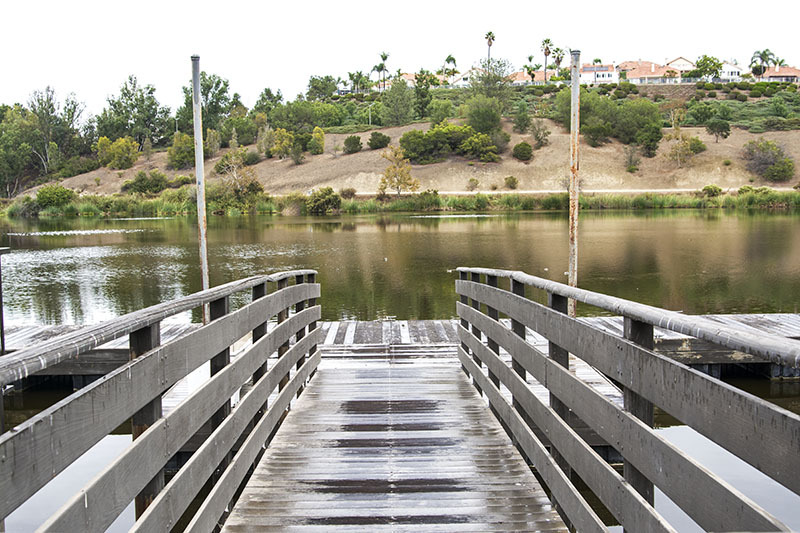 Two pedestrian bridges give access to remote picnic areas and hiking trails. Some of the picnic areas can be reserved and they featured a sheltered area with picnic tables, plus barbecue stoves are provided. 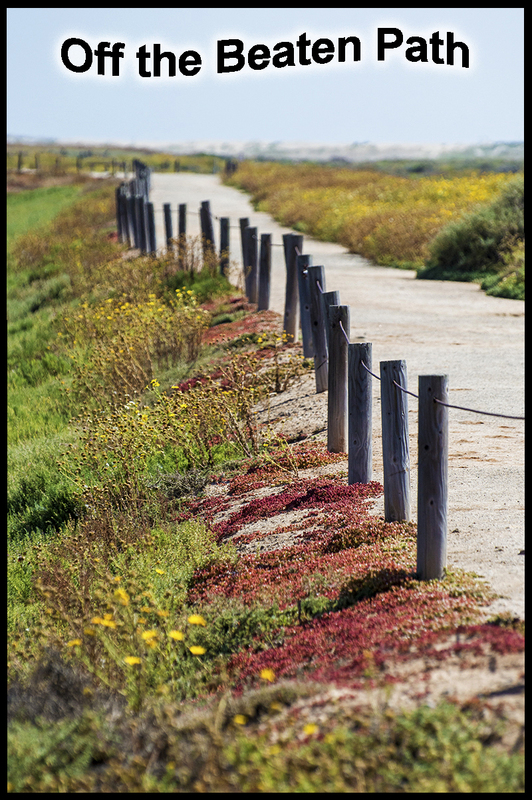 There is also a two mile jogging trail, volleyball courts, four lighted tennis courts, and even a remote control glider area. 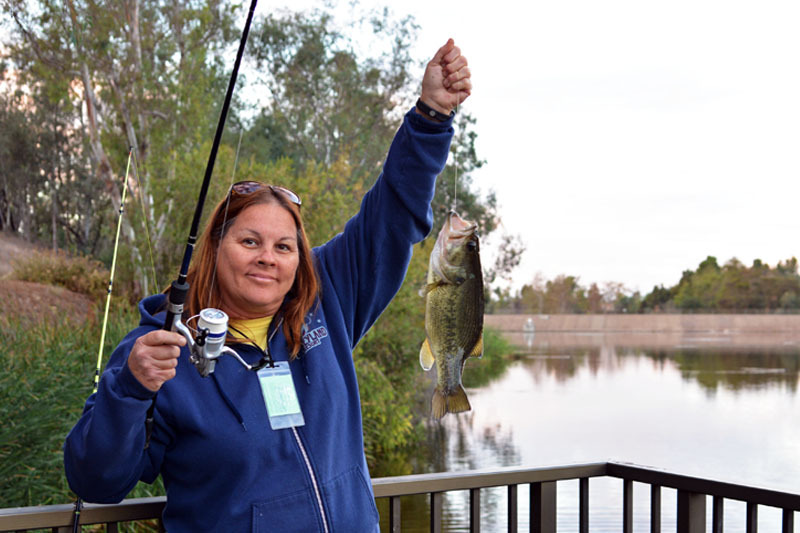 It was clear from what we saw that the lake is a great place for families and kids to come fish, but also for serious enthusiasts. That bass was no joke. Give it a try when you are in the area and if you hear or see three girls squealing and yelling, it’s probably us because quite frankly we do it whether the fish is two inches long or 18 inches long.